Spanish tapas are probably the best known, or most promoted, part of Spanish cuisine. As a lover of Spanish tapas I can understand why and will one day share my favourite Spanish tapas recipes with you. However this post is to let you know about our favourite Spanish breakfast … pan con tomate y aceite. Having grown up in northern England as a child, breakfasts were cereals, muesli, toast and jam and of course the good old English fry up. I would never have dreamt that, one day, one of my favourite breakfasts would be oil and tomatoes on toast! 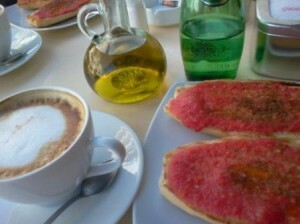 In the Malaga province, pan con tomate y aceite can be ordered in any Spanish bar or cafe and is probably the most popular Spanish breakfast. Each establishment has it’s own way of presenting the dish but the result is “usually” always delicious. In a blender, add: ripe and juicy tomaotes (the bigger and riper the better, with middle and seeds removed), a dribble of olive oil and a sprinke of salt and black pepper. Blend until you have a relatively smooth consistency. Pour the mixture into a pot and put in the fridge until chilled. Serve on your preferred type of bread. See, we told you it was a very easy Spanish recipe! As with most Spanish cuisine, the secret lies in the quality of the ingredients! ¡Bon provecho! Do you love chocolate? Did you know you can make your own chocolate bar in Spain? Did you know that there is a chocolate factory in Mijas pueblo? As self-confessed chocoholics, it was obvious that we would be visiting the new chocolate factory in our village, however we had not imagined actually making our own chocolate bars. 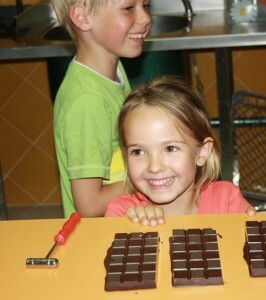 Here are some pictures of our visit to Mayan Monkey Mijas … the World´s Smallest Chocolate Factory in Mijas! The expressions on the children´s faces say it all … they loved it! Well, who would not love the idea of chocolate on tap! Eli was very attentive and explained the process in enough detail that the children remained interested the whole time … their only frustration was the waiting time for the chocolate bars to set … LOL! So, if you are visiting our beautiful village of Mijas pueblo, make sure you pop into the Mayan Monkey Mijas, Chocolate factory and taste some of their gorgeous chocolate and delicious ice creams! Just make sure you ask the price before getting too carried away! Address: Mayan Monkey Mijas. 524 Plaza de la Constitución. Mijas Pueblo. 29650 Málaga. Tuesday 21st February 2012 is Pancake Day. What is your favourite pancake topping or filling? Do you prefer savory or sweet? 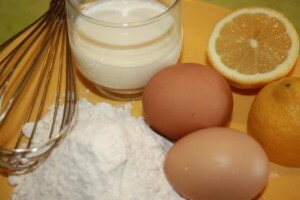 Make a well in the centre of the flour and add the 2 eggs, a splash of milk and 1tbsp of oil. Mix all the ingredients together until you have a smooth paste and then beat well. Add more milk if the mixture is too heavy to beat. Continue whisking the mixture until all the remaining milk has been added and you have a slightly thick consistency. Ensure you have a good non-stick frying pan (particularly if you are having a pancake tossing challenge!). Very lightly oil the frying pan and place on a medium heat. Add a big spoonful of the pancake batter and tilt the frying pan to allow the batter to cover the base of the pan evenly. If you have added too much batter, do not worry, quickly pour it back into the bowl. The pancake will lightly brown within about 30 seconds. Before attempting the big toss, gently ease the pancake from the pan base and then go for it! Remember, it is all in the wrist action and the “flip” is aided by pushing the frying pan away from you as the pancake is launched into the air and pulling it back into you as you catch the descending pancake. Once you’ve had you fun, get creative with the fillings & topping … our children love the good old savory pancake stuffed with ham, cheese and egg followed by a sweet ice cream & fruit filling. Happy Pancake Day …. Now, let’s see how high can you toss your pancake! The amount of spice you add can be varied subject to your own personal taste. Pour half the chickpeas and half the beans info a food processor. Add the crushed garlic, cumin, lemon juice and yoghurt and process until you have a smooth paste. 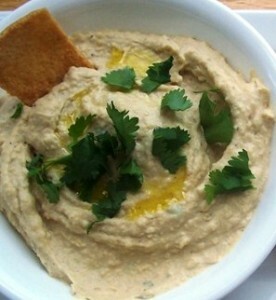 Slowly add in the remaining beans and chickpeas until you achieve the desired consistency. Finally, stir in the lemon zest & chopped corriander. It’s that time of year again … after weeks of over eating and excessive drinking during the festive season , (and this Christmas we did go over the top ) , the “D word” hovers menacingly at the back of our minds. Well, having completed the Detox Plan last year and punishing our bodies to little avail we have this year ousted the Detox diet and jumped on the “lifestyle change” bandwagon . That is the 2012 jargon isn’t it? So rather than really horrible boiled cabbage soup recipes that we forced ourselves to gulp down for only 7 days (of the whole year) , we are going to try new recipes using more healthy and alternative ingredients for as long as we can. Coming soon … Beetroot Brownies! Preheat the oven to 180C / gas mark 4. Grease a loaf tin. 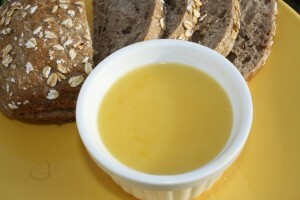 Gently heat the butter, sugar, treacle/syrup and zests in a large saucepan until everything has melted. Remove saucepan from the heat and add the grated carrot, flour (sieved) , bicarbonate of soda, ground ginger, salt & pepper and eggs. Stir well until all the ingredients are evenly mixed together and you have a smooth mixture. We share an Easy Lemon Curd recipe: 5 ingredients and 5 simple steps. 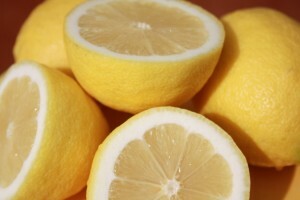 Anyone that has a lemon tree in Spain will agree with me, I am sure, that when you have lemons, you have lots of lemons. In fact, often more lemons than you know what to do with. You give generously to your friends and neighbours but they are still loads of lemons. A neighbour of ours very kindly gave us a bag of lemons last week. A large, shopping bag holding almost ten kilos of lemons. So began my lemon quest, bearing in mind that we are trying to eat healthily and so the typical sweet lemon puddings are out of the question. A family favourite of ours is lemon and garlic roasted chicken. I also have several ice cube trays filled with lemon juice, grated lemon rind and fresh coriander, waiting to be used in savoury rice dishes. I have a few freezer bags of frozen lemon slices waiting to be popped into a glass of gin and tonic. I have a jar full of preserved lemons, thanks to Annie B’s kitchen recipe and this morning, with thanks to La Rosilla I had the most amazing home made lemon curd that was amazing … so amazing that I had to share this very easy recipe with you … Enjoy! Tip 1 : Grate the rind off the lemons before juicing them! In a microwave-safe bowl, whisk together the sugar and eggs until smooth. Stir in lemon juice, lemon zest and butter. Cook in the microwave for one minute intervals, stirring after each minute until the mixture is thick enough to coat the back of a metal spoon. Remove from the microwave, and pour into small sterile jars. Store for up to three weeks in the refrigerator. Tip 2 : If you forget to stir, or over cook slightly, just pass through a fine sieve. With the continuing bad weather across Eastern Europe, the unbelievable amount of snow and ice in the UK and major disruptions and delays to all flights, we have decided that our trip back to see the family in London for Christmas may not actually happen this year. We are still planning to go to Malaga airport on Thursday, laden with lots of activities to keep the children entertained. However, we are also keeping an open mind and accept the fact that we may well return to Mijas to spend this Christmas in Spain . If Easyjet offer a full refund, we will take it and enjoy spending the money here instead. So, this afternoon I am heading off to Iceland to buy the ingredients to make this really delicious and easy Christmas Cake recipe. All measurements are approximate (I rarely follow recipe to the note), and I would personally recommend adding brandy whenever you pass by the kitchen … the more the merrier ! To decorate, I just add a thin layer of marzipan and plenty of royal icing. Last year it lasted us around three months and was moist and tasty to the last mouthful. Line 20.5 cms cake tin with two thickness greaseproof paper. Mix prepared fruit and nuts. Sift flour, salt and spices. Cream butter, sugar and lemon rind until pale and fluffy. Add eggs , little at a time, beating well after each addition. Fold in half the flour, using a metal spoon, then fold in rest and add brandy. Put into tin, spread mixture evenly, making sure there are no air pockets and make a dip in the centre. To avoid over browning cover top with several thicknesses of grease proof paper after 1 1/2 hours. Even if we do make it back to see the family this Christmas, the cake will be waiting for us on our return. Let me know if you try this very simple recipe and also feel free to share any other tips. Sometimes, you need a little inspiration, sometimes you feel the need to explore and sometimes you just need a few days away, Well I wanted all those things, don’t mean to sound greedy, but I suppose I’m perpetually greedy In many ways. Having started my new Venture of La Rosilla, Lifestyle and food , in the early summer, I am constantly researching for recipes, new ideas and like minded people, in any way I can, be it through books and references, visiting restaurants and markets and trawling and contributing to social networking sites. One day whilst ‘Tweeting” I became ‘twiends’ with Family Life In Spain , so took a look at their excellent website, and blogs and all things Spanish for the Expat, during my perusal, there being advertised was Annie B’s Spanish Kitchen . I knew there and then after clicking on her site, this is where I needed to go, for my Inspiration. So after many friendly emails, to Annie, I booked rather guiltily , well As a Mum you think there is always something more important than yourself, to go on my Foodie adventure. I had a glorious sunny journey from the Campo of the Malaga mountains, along the coastline of the Costa del Sol, and into the stunning scenery change of the province of Cadiz. Stopping en route at Gibraltar for the obligatory grocery fill. Reaching my destination of Vejer de la Frontera looming above me, on its perch overlooking the sea and foreign lands of Africa. 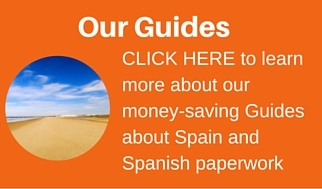 The most stunning town, with cobbled streets, and traditional Andalucian Patio town houses. Many bars and restaurants all tastefully renovated and offering local dishes and tipples for even the most discerning palate. I was met by Annie and led to her beautiful home and her superbly set up Spanish Kitchen, and immediately met fellow students graving on lunch they had prepared in the Andaluz patio, and was offered a chilled Rose, and excellent conversation, to really whet my appetite for things to come. Our evening started on a Tapas crawl, through the traditional town, stopping off in many bars, to sample, Jamon and Queso, with a chilled manzanilla, then Tostados and Boquerones, to name a few. The little town was vibrant and lively with a buzz of good living. My second day, was “Fruits if the Sea’, we headed coastal to the Market town of Barbate, to the amazing fish market. With fresh catches everyday, a hub bub of activity and bustle. Full of life, and vitality, here we bought Seabass and Bream, Anchovies and Prawns, along with fresh vegetables, herbs and fruits, sampling as we went, and learning also some of the more unusual campo delights. Back to the kitchen,and cup of hot frothy coffee, before our lessons commenced. Annie expertly guided our small group through the dishes we were to cook and handed out our recipes for us to follow, it was very hands on, which is the best way to learn. Salt baked fish, hand cured anchovies, Prawns with dipping sauce delicious, a little taster of fried Boquerones to keep us going and a soupcon of sherry, just in case ! We prepared Ajoblanco and a scrummy Tart with marinated dried fruits. All this was hungry work, but time whizzed by, I could have stayed forever, and our late lunch was upon us. The sun put his hat on once more, and we were able to enjoy our lunch Al Fresco even in late November. I met some amazing people, from Dubai, New Zealand, Scotland and USA all with one common interest. We chatted, we laughed, we ate and we drank together. I felt rejuvenated, and inspired, to put into practise and share my love and knowledge with my clients at La Rosilla. One thing is for sure, on my Eat, Love, Pray adventure, Annie B´s is the place for me. No Christmas is complete without Sherry. Lots and lots of Sherry. In fact, Sherry is such a versatile wine that it would be possible to match a different Sherry for every course of our traditional Christmas Dinner. Pedro Ximinez, the sweetest of the Sherry grapes, is not only the perfect match to drink with Christmas Pudding, it also is one of the few wines that perfectly matches with dark chocolate. Here are a few ideas for Christmas desserts that would win me over. Fill a jar with seedless raisins and top up with PX Sherry. Leave for a few days until raisins swell and soak up the PX. You can use these raisins for anything. Even on top of porridge on Christmas Day. Or on any day for that matter! I like to pop a few scoops of good quality chocolate ice cream into a pretty glass and then top them with several spoonfuls of these glistening brown jewels. Stick a couple of Mikado Sticks into the ice cream to serve. Here is a wonderful Chocolate & Almond cake you can make well in advance of C-Day. Not onIy is it really easy to make – just using the Magimix, it freezes brilliantly. 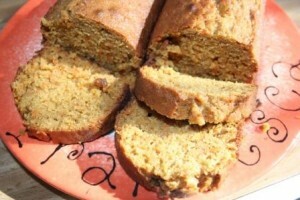 Garnish it with a couple of spoonfuls of PX soaked raisins and spoon some PX over the top of the cake too! Warm oven to 160c or 325F. In food processor, blend the chocolate and cocoa with the almonds into a fine paste. Pour into a bowl. In the same blender, cream the butter and the sugar for 5 mins until light and fluffy. Add one egg at a time and mix in the chocolate almond mixture until well combined. Coat a 9inch pie dish with bakewell paper. Fill with the chocolate mixture. Bake for 45 mins. Turn onto a serving dish, cool and sprinkle with icing sugar before serving. Who doesn’t love food? Admittedly, it can be a real pain when you have to cook every day … especially when children are involved. However, a lot of pleasure can be gained from cooking, especially when the children clear their plates and ask for more. Spanish eating habits are very different from the British, yet we have welcomed the change in eating style and as a result, our children have benefited. In our “Recipes” blogs we will share some really easy recipes for our favourite dishes and also some wonderful recipes provided by our lovely “foodie” friends. 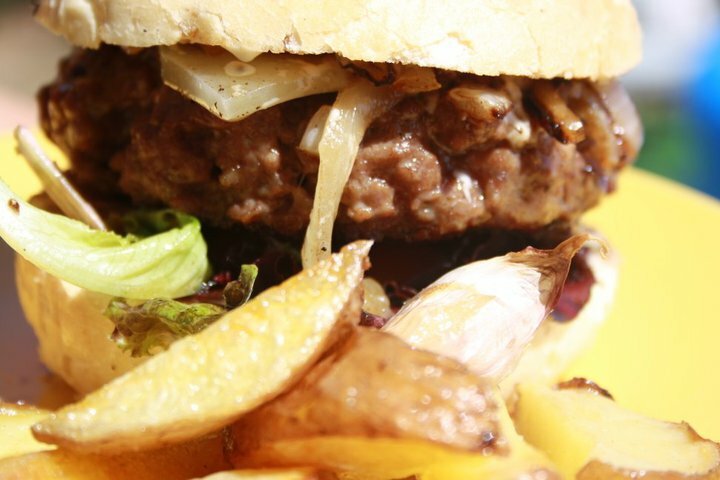 We would also love for you to share some of your family favourites … ¡ Buen provecho ! PS: If you’d like a free sample of our English / Spanish language-learning activity cookbook for children, just SIGN UP HERE.